A break in the weather gave me the chance to install my Solar panel but without Mr. Sun doing the brightness bit my batteries are getting little power at the moment. When i first installed it in the horizontal position with an absence of sun the control box was reading 0.27amps and the voltage from the panel wires read 13.38v so at least, i`m assured by other boaters, it works. All i need is sunshine to see the amp reading climb and it wasn`t long before i got my wish and with just a weak winter sunburst the amps hit first 3 then 4. I don`t expect much this time of year but come the summer sun i can imagine a lot of power from the panel will result in less engine running. Less diesel used will eventually pay for the panel but the green brigade will still complain of the Carbon Footprint left by it`s manufacture but to be honest my intention is to save diesel and wear on my engine. If i worried about Carbon footprint i wouldn`t have had a boat manufactured but that also applies to any purchase we make so where do we draw the line. Perhaps I/WE should be happy that the making of this panel will cut down on future pollution from my engine. I do believe, and by all means have your say, that as a live aboard boater my footprint is a lot less than when i lived in a house. I use logs for the majority of my heating, no gas boiler heating a big house. Minimal lighting needed on a boat with no lights left on all over the house. No electrical appliances left on standby. No car so making better use of public transport. No regular decorating which includes new carpets and furniture. Engine generates not only electricity & hot water but moves me around the country, does a car do all 3. The list is probably bigger but all the above not only cuts my footprint but more important in these times of recession drastically reduces my cost of living while giving me a wonderful stress free life. enables the panel to be turned through 360 degrees to face the sun. The top part enables the panel to be angled and i have bolted and riveted the panel into this section and the whole unit is bolted down on the roof. I have fixed two legs to support the panel from the rear all being folded flat when travelling. Something i`ve not noticed before is the Little Grebe. 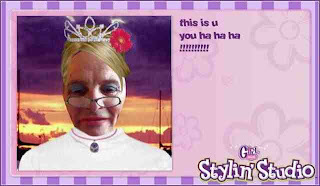 Recently had an e mail from one of the g`children, yes that`s me in the picture. I remember over Christmas being shown a present, "just sit and look at this" Jordan told me. My image was captured and suitably or perhaps not decorated with glasses and head gear and if you look closely eye shadow & lipstick. I wouldn`t mind but it`s not my usual colour. When ice is melted by increasing its temperature, the open cage structure starts collapsing due to partial break down of the hydrogen bonds. H2O molecules start to come closer; also the water molecules separated from ice structure fill the vacant spaces in open-cage structure. This results into concentration of volume. Hence, the density of water starts increasing on heating above the melting point of ice and becomes maximum at 4°C. On further rise in temperature, the kinetic energy of molecules increases and they once again start moving away from one another. This causes expansion, which is much more than the concentration caused by breaking of hydrogen bonds. Therefore, above 4°C the density of water once again starts decreasing. Thus, the maximum density of water is at 4°C. There now you know what happened to all the ice that stopped all the boating the last few weeks. It`s no good just saying the ice has melted you need to know what is happening so i`ve delved into my scientific brain( the internet) and now you know. become so familiar over the years today it all seemed like virgin territory. Under the fancy stone bridge the Earl of Essex insisted was built before he would allow the canal to pass through his land. On through Lady Capels lock alongside the wharf entrance of the same name. Lady capels wharf came about because of coal duties imposed by the Corporation of London on coal shipped by sea and when the canal was born a clause in the act that was granted to the canal company prohibited coal being transported into London. The wharf was set up to off load coal for shipment by horse and cart untill later when coal was allowed into London upon payment of fee`s paid on tonnage. 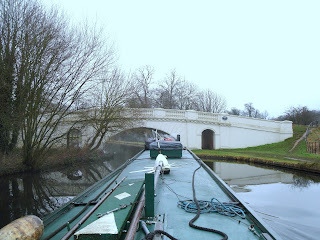 I took this through the gate at Lady Capel lock because i was so happy to see NB Valerie with no ice imprisoning her. You can see how the gate paddle has been wound up allowing the water to empty from the lock in case any non boaters are interested. The white plate that covers the hole is plastic as opposed to the originals that were wood. 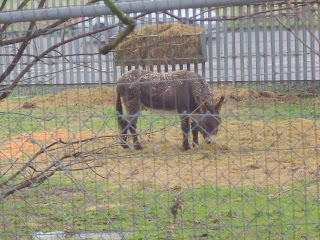 On through Hunton Bridge locks and the old beast has been there for.....donkeys years....sorry. a lot of searching on the webbernet came across a fellow boater running a cottage type industry from her boat. When sourcing led bulbs you will find some that seem cheap but be wary these tend to be only rated at 12v and as we boaters know when running the engine to charge our batteries voltages above 12v can be running through the wiring. In fact i have just put a meter on one of my sockets and got a 14.6 reading that could cause these cheaper bulbs to fail. The ones i have purchased are rated at 10-30v so this problem is avoided. 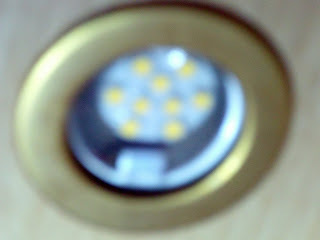 The picture above shows my spotlight above the dinette that has 12 LEDs and below the ceiling lights have 9LEDs. The site you need if interested is HERE ask for Sarah and say Les sent you. I`m not on any commission and only give this link because of the 1st class service i recieved. 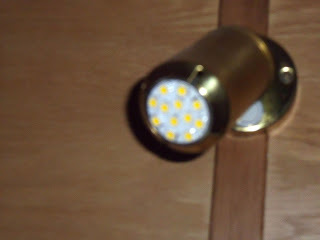 The 1.8w and 2.4w power of these bulbs is far less than the 10w Halogens i replaced with just one section of 4 ceiling lights amounting to 7.2w against the original 40w of the Halogens so you can see a lot less demand on your batteries. Bet the blog title got the guys attention. Sorry lads no pin ups. Just recently being iced in has given me so much time on my hands that i have been reading more boaters blogs than usual some for the first time and some that have remained un-read for a considerable time which along with my usual list of regulars has left me somewhat Blog eyed. It`s a bit like RPI (repetitive strain injury) but with Blog eye after switching off the laptop and say your looking out the window one eye will see the trees whilst the other will see a blog page. 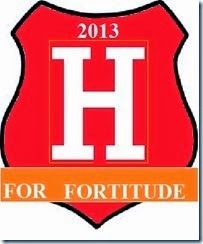 Maybe i should sue the bloggers or the blog administrators..................get a life Les just stop reading so many. Anyway what i`m trying to tell you is that reading all these blogs it came to my attention that many were reporting the temperature or lack of it outside the boat and the abundance of it inside as recorded on many different electronic gizmo`s and i thought it was about time i up-graded my temperature device. Now my present system requires no batteries, is fully portable and has no restriction on min/max temperatures that it will record. Unlike modern day gadgets it has no digital readout but a voice, as in the sat-nav boxes, which uses phrases like "blimey it`s hot" or "it`s ffffffffffffff freezing" so you have no need of digital technology. All sounds very 21st century so why up-grade i hear you say........well this gadget is 62yrs old not called a Wii but a Me. So with all this time to use up i wandered around town and came across a newly opened branch of Clas Ohlson a company that originated in a small Swedish village back in 1918. It`s an IKEA type shop but on a smaller scale with just 7 shops in the UK so far selling not flat pack furniture but all sorts of small items, click the link and have a look. 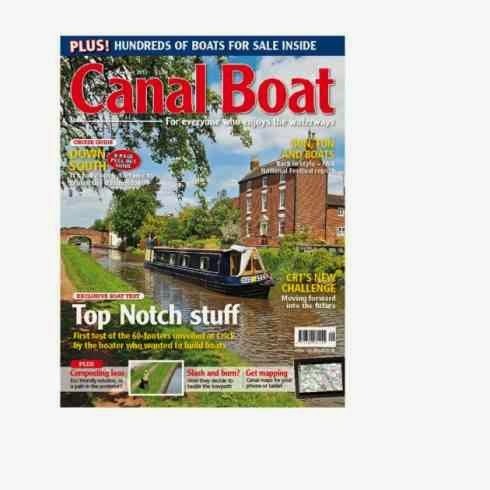 Hardware, electrical, home and in the drop down box under leisure you`ll find boating. One of my purchases pictured below cost £3.99 and i thought why not have a "boys toy" as a back up to my old`Me`. So toys are for playing with and my first playful experiment was to test the surface temperature of my recently carpeted lower half of the boat. Ignore the readings in the picture for now because what i did was to use the outside probe that comes with about 2 metres of cable and placed it on the carpeted wall near the floor for half an hour and for the same time on the one remaining section of wood panelled wall 3" to the left at the same height. OK too much info but this is a scientific test and we must be precise. The reading on the original wood panel fell 2.5 degrees so the carpet has made a big difference, Big deal! Holy smoke! Wow! I didn`t need this gizmo to tell me, my 62yrs old `Me` temperature device emitted a new phrase as i sat at the dinette "that`s a lot better" it said. Next up is just how hot is it in the boat and for this the device was placed 2` above the floor roughly a 1/3 of the internal height of the boat sort of groin level.....Whoops can i say groin? after all this is a live broadcast worldwide and you know what happened to Johnathan wossi Ross, no it`s fine so say my behind the scenes production team. Now before this experiment started my original `Me` device told me i was warm and comfy sitting in a short sleeved shirt. In the picture the device reads 20.0C at 19.27 and looking at it now a day later it reads 19.3 so my question is should this device rule my life, do i rush off now and put on a sweater as the gizmo says the temp. is dropping. No, no, no i will decide my own comfort level this is just a toy. Another thought on these temp. thingy`s where do you site it, halfway up the wall or as in my scientific test a 1/3rd up. I`ve just hung it up on the top of the curtain rail and in the last 5mins it has climbed to 25C and rising but i still feel the same with no desire to start a narrow boat nudist colony. Yep my minds made up, just numbers take my advice and do the `Me` test. Above another of my purchases at the Clas Ohlson store was this 60LED work lamp complete with not only a mains charger but for us boating folk a 12v charge plug. With 5hrs life between charges it is far from a toy and in fact had it`s first use today when down in the engine hole checking the battery levels. Normally £9,99 i picked it up at a sale price of £6.99. Above one of the windows glazed with the Storm guard film and as i said in the last blog it looks just like a normal window but without the condensation. Just a bit of fun this blog and i can assure all my timid readers no gizmo was harmed during testing. A happy new year to you all and if the cold and icy conditions are getting you down don`t despair the day`s are getting longer and summer is on the way. I always look on the Christmas break as being the summit level of winter and once it`s passed the view of spring and warmer weather can be seen from this high point in the not so far distance. Well all good plans go wrong and this year wrong they went big time. After my trip to Paris the plan was to cruise north up the Gd. 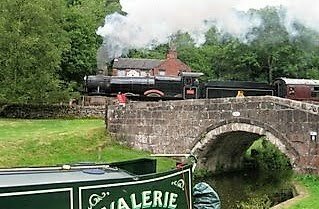 Union to Cow roast near Tring so as to be not only close to all the family but to also be in a better position to get through the stoppages at Stoke Bruerne and Braunston after Christmas. 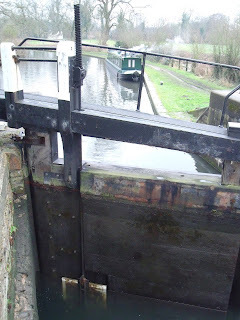 It all went wrong a week before Christmas when the snow first fell but this didn`t put me off i decided to push on but after doing a few locks that were snowed in and walking across slippery lock gates i decided life was to precious and moored up for the holiday. After the snow came the frozen canal and more snow so i am now resigned to not getting past Braunston until the work there finishes on March 5th if BW finish on time. The section i was moored remained slightly iced up owing to the River Gade flowing in but above the lock the ice had taken a strong hold. in the picture above i had come up in the lock to get water and left the boat in the lock and managed to stretch my hose to the water point that can just be seen on the far left of the snowy towpath. 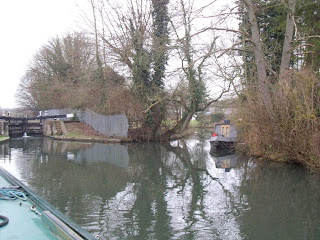 It was then just a case of going back down in the lock and reversing to my mooring. So i have water, coal, wood and diesel also local shops nearby and the town centre 25mins walk so let it do it`s worse i will survive. area uncomfortable. My solution was to add insulation to this area in the form of carpet with the top half of the walls left as oak panels, two days on and the difference is very noticeable. Before the carpet solution having the fire belting out as much heat as possible led to an increase in condensation on the windows and so i decided to try a double glazing film that had been mentioned on a canal Internet forum and also by my friends Dot/Derek on NB Gypsy Rover. The result was amazing with no more wet windows to constantly wipe and the cost of 2 packs a modest £8.30. All you do is apply double sided tape around the frame, cut the film to size and apply to the tape and apply gentle heat from a hairdryer all over and the film tightens making all the ripples disappear. Tried to take a picture but the film was so clear it didn`t properly show so you just get a pic of the pack. So a couple of jobs have helped pass the time and the weather forcast that usually i`m not bothered about indicates rising daytime tempratures towards the w`end so perhaps a move might soon be possible.